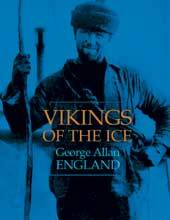 Vikings of the Ice by George Allan England (Rattling Books) is the only a Canadian finalist for the 2011 Audie Awards, which honours the year’s best audiobooks. Narrated by actor Frank Holden, the Newfoundland and Labrador audiobook is a finalist in the history category. Vikings of the Ice, Being the Log of a Tenderfoot on the Great Newfoundland Seal Hunt was originally published in 1924 by Doubleday, Page & Company. The Audies are presented annually by the Association of Audio Producers. Over 1,100 audiobooks were submitted for this year’s competition. Winners will be announced May 24 in New York City. UPDATE: Canadian Robert J. Sawyer’s novel Watch (Audible Inc.) was also nominated for an Audie in the Science Fiction and Fantasy category. In 2009 he won for his book Calculating God.